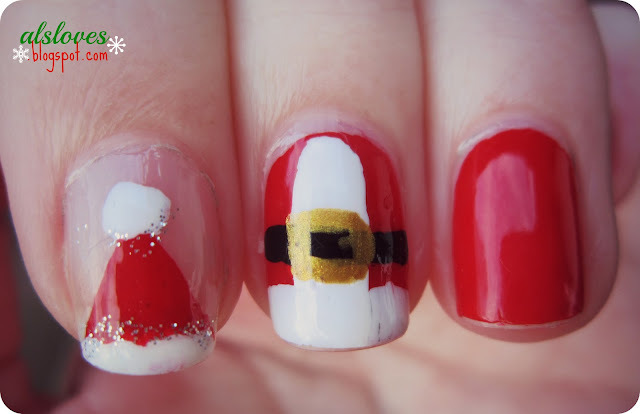 This post is the nail art I attempted and pretty much failed this holiday season, I saw cutepolish upload a video about Santa and elf nails, so I tried it out and it looked awful so, I took off the elves and this is the Santa part of that tutorial and did the lilypebbles Santa hats. 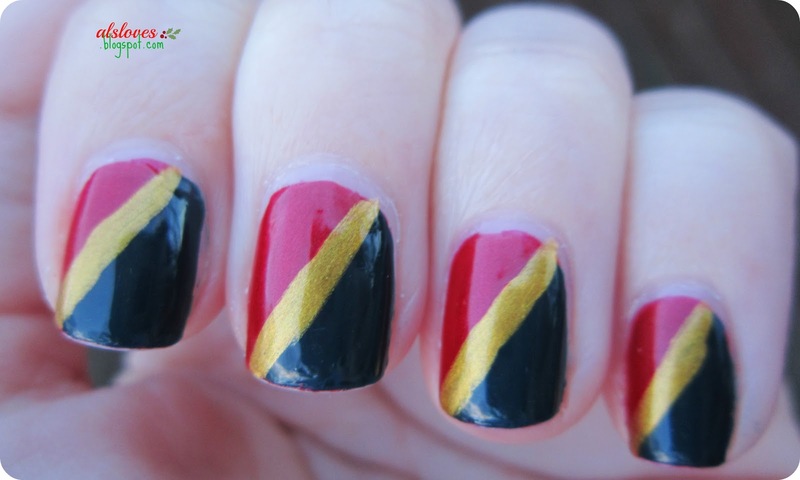 I used Gosh Oh My Gosh colour in Classic Red, Sally Hansen Xtremewear in White On, and the Art Deco stripers in black and sparkly silver and the Revlon Nail Art Expressionist in Vincent Van Gold*. For the Santa hats I used tape to make triangles and used a dotting tool for the white. So even if only one nail works out, just remove the rest and make it an accent nail and its brand new again! This is another fail that would have definitely worked had I chosen different colours, with either red, white and silver, or just a lighter green for this one. So I used OPI and Nicole by OPI Khloe had a Little Lam Lam with the Revlon Nail Art Expressionist in Vincent Van Gold*. I was asked more than once if it was the Jamaican flag or Harry Potter related, so if that's what you're after this is great haha. I have a lighter green that would have maybe made this more festive but oh well, ya live 'n learn. I feel like I'm not the only one who messes up, or makes poor colour choices, so I would love to know what you guys have messed up too, especially since I think themed nail art is the hardest! Also, I was given the Revlon nail striper for consideration by entering their revlonselects thing on their facebook page, which was crazy cool and unexpected, so like them if you're into that!